1. The Floating City - This city is one of a kind; made up of 118 small islands that are separated by canals and linked by bridges. Don't worry about cars, the city is 100% pedestrianised. Just watch your step!! 2. Unique Hotels - Not a commercial high rise hotel in sight. Venice offers a variety of independent boutique hotels accompanied by incredible views and grand entrances, perhaps one of the only city's where you get a water taxi to your hotel door! 3. Food & Wine - Cicchetti is a must. Venice's version of Tapas, and it is Molto Bene! They're cheap, quality, small dishes that you can share with your beau or friends. Seafood and fresh pasta is in abundance. Oh and let's not forget the delicious wine either. Oh and that dolce, dolce, Gelato. Yum. 4. Architecture - Venetian Gothic Architecture is a wonderful mix of Byzantine and Moorish influences and arches, lots and lots of arches. The buildings are incredible and you will be snapping away until your camera (like mine) will be full of random buildings. Worth it. 5. The techno-coloured island - Take a boat trip out to the islands of Murano (known for its glass, you'll see this everywhere in Venice), Torcello and finally, Burano. Each house is painted a vibrant colour, which has to be picked from a set colour list. So organised. You can buy handmade lace here too. 6. Romance - There's just something about Venice that oozes Romance, maybe it's Gondoliers' serenading or perhaps good old Casanova left a bit of his charm in the air. Who knows. But my god Venice has all the love feels. 7. Photography - It is impossible to take a bad picture in Venice! Everywhere you look is a postcard worthy photo, wander the alleys and get completely lost or book a walking photographer who will teach you to make the most of your camera and the hidden views of Venice. 8. People watching - order a coffee (we all know the Italians make great coffee!) or a Vino, in one of the many cafe's that line the grand canal, sit back and take it all in! You will witness the hustle and bustle of tourists flocking to the Rialto, couples taking a romantic gondola ride or locals doing their daily shop at the fresh market. 9. 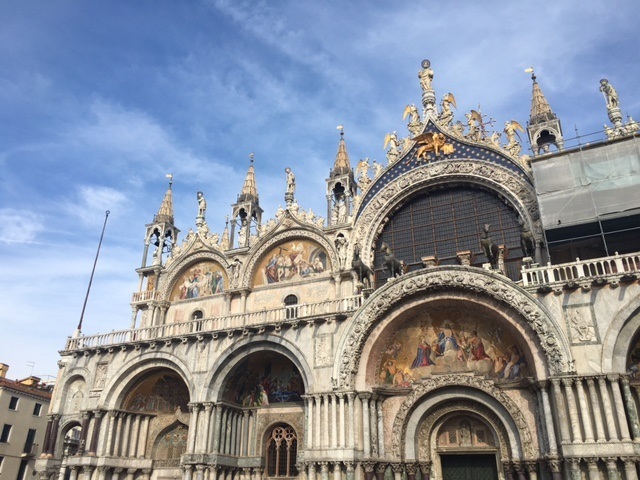 Accessibility - Venice has great transport links, fly in to Marco Polo Airport and take a water taxi, arrive by train to Stazione di Venezia or incorporate a trip to Venice as part of a Italian rail trip! 10. Before It's Gone - Inevitably over time Venice will disappear; make sure you experience everything this magical city has to offer before it's too late! If you've been tempted to visit Venice for a while, I hope this list has inspired you to take the leap and get yourself there to experience it all for yourself. So get researching now and book those flights!